Smelled OK. First sip was inconclusive (all test subjects agreed). Second sip revealed a flavor that was cousin to Cream Soda, but with something extra (one test subject suggested "blue" soda flavor). Thinking that everything was OK, i settled back and began treating it like an ordinary beverage. But over the course of the next few sips, something happened. Something... sinister. With each subsequent sip, the soda became more foreign, less enjoyable. It was too sweet, too thick, too... funny tasting. By the time i was half done with the can - and we're talking an 8oz can here - i couldn't drink anymore. I had to start alternating with another beverage. Even then, i found i could not bring myself back to drink more of this sickly sweet stuff. The other test subjects refused to help out. Finally, i had to chug the remaining beverage, attempting to not taste it as it passed through my mouth. 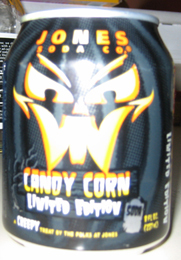 And that was... Jone's Candy Corn Soda.